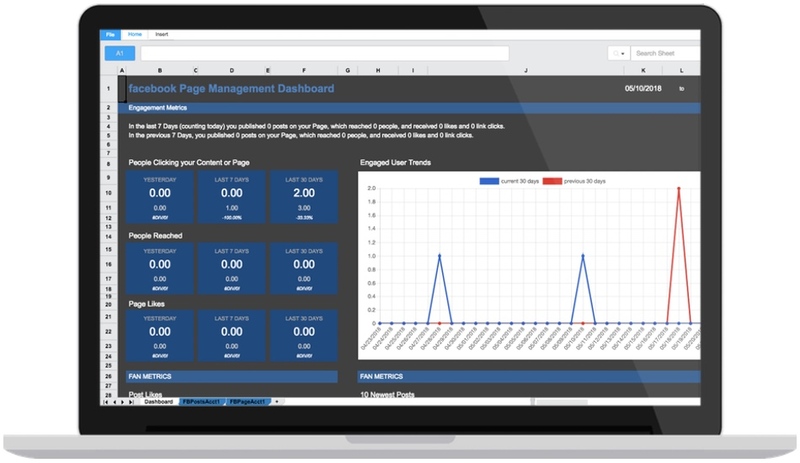 ABSTRACT: This Marketing analytics KPIs spreadsheet spreadsheet template provides digital marketers with a beautiful, fully automated, Marketing Analytics Dashboard and a Monthly Analysis Report that tracks all of your digital marketing KPIs from Google Analytics, Facebook, and Instagram in one place. You also get a 12 month data KPI report tracker so you can benchmark and review your KPIs (progress) for a 12 month period. Once you have copied and added the template to your account (FILE>Duplicate), you will notice that the dashboard and the monthly report spreadsheet tabs are essentially blank with zeroes and errors. This is normal because because you have not connected your spreadsheet to the Google or Facebook Data sources. This report tab is a digital marketer’s dream. Not only is it filled out automatically but you can alter the dates to compare different time periods. By default, the template is comparing two different months but you can easily alter the dates to show a week over week comparison. The report demonstrates KPIs for acquisition, engagement and outcome and you should think of this spreadsheet in three sections. First, we start off with total traffic and total leads from that traffic. This data comes from Google Analytics and requires your Analytics Goal Completions to be set up. Secondly, we include your Ad Spend numbers per platform (rows 34 to 52). Consider the average costs per conversion to determine where your best ROI will come from. The cost per conversions are using GA as the source of truth for your conversions and not the Facebook reported conversions. Finally, we provide a breakdown of all leads generated per channel. These leads are reported by Google Analytics as visitor Entrances into your site. We also include the Facebook-reported leads so you can compare for data discrepancies. As you move across, you will notice that the tab includes a 12 month outlook for these data points to help you spot seasonality and conversion trends. You can also continue to add specific KPIS below the Leads section by simply writing and referencing the connected tabs. 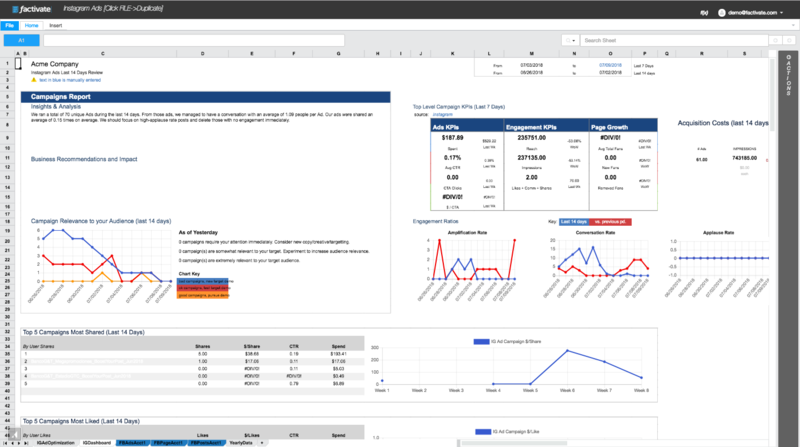 The Marketer Analytics KPI Spreadsheet Template was built to help you aggregate and analyze your Google Analytics website, Facebook, and Instagram data from one place automatically. We hope the template helps you become a great digital marketer with just a few clicks. Please email us at info@factivate.com if you have any questions or leave a comment below.